The global market for VCSELs is considered as fragmented in nature with an existence of several players operating worldwide, states a new research report by Transparency Market Research. The key players in the market are emphasizing on product innovation and the rising research and development activities are predicted to support the development of the overall market in the forecast period. Moreover, the increasing mergers and acquisitions and strategic collaborations are anticipated to offer potential growth opportunities for the market players in the near future. 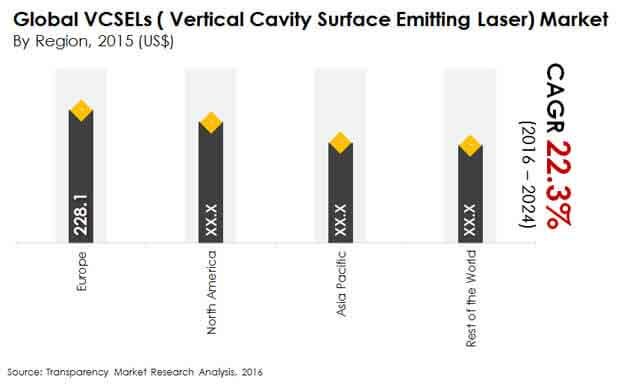 The key players operating in the vertical cavity surface emitting laser market across the globe are Royal Philips Electronics N.V., II-VI Incorporated, Panasonic Corporation, Newport Corporation, IQE Public Limited Company, Broadcom Limited, Princeton Optronics Inc., Finisar Corporation, Lumentum Holdings, Inc., and Coherent, Inc.
As per the research study by TMR, in 2015, the global market for VCSELs stood at US$775.2 mn and is estimated to reach a value of US$4,728.8 mn by the end of 2024. The market is estimated to register a potential 22.30% CAGR between 2016 and 2024. From a regional viewpoint, Europe is projected to hold a major share of the global VCSELs market and is expected to remain in the similar situation in the coming few years. North America and Asia Pacific are projected to witness healthy growth throughout the forecast period. The increasing adoption of the medical applications and proximity sensing is considered as a key factor that is likely to encourage the growth of the global market over the next few years. A significant rise in the use of VCSELs for the data communication and the increasing use of VCSELs in the infrared illuminations are projected to support the development of the market in the next few years. The growing focus on the research and development activities is likely to accelerate the market growth and generate potential growth opportunities for the players in the coming few years. In addition to this, the rise in the demand for VCSELs with technological developments in the automotive electronics sector is expected to ensure the market growth in the near future. Also, the development of the consumer electronics sector and the advent of laser-based hard disc is projected to enhance the growth of the overall market in the coming few years. The global VCSELs market is likely to observe several challenges, which may hinder the growth of the overall market over the next few years. The limited data transmission range is estimated to curb the market growth in the near future. In addition to this, the long wave-length InP-based VCSELs offers a lot of promise as the lasers are at an early stage of commercialization. This is estimated to hamper the overall development of the market in the next few years. Nevertheless, the rise in the number of applications and the rising demand for gallium arsenide are further anticipated to enhance the development of the global VCSELs market throughout the forecast period. North America to lead the global VCSELs market with the presence of a large number of players operating in it. The rise in the number of players and the increasing technological advancements to support the growth of the market in the near future.